Big Fish Audio is proud to present SMACK: Claps, Snaps & Stomps! A time-saving resource for the modern composer, this collection of various claps, snaps, stomps, bass drums, shakers, tambourines, and found percussion will easily unlock your creativity. This unique percussion virtual instrument is the perfect tool to add color to music of any genre, or provide the foundation for your next composition. SMACK was created to save you time and enhance the creative process by deeply sampling various groups of percussion, claps, snaps, and stomps. With single, small group, and large group options, there are limitless songwriting applications! Use the intuitive user interface to easily navigate between up to 10 groups per patch, and strengthen each sample by adding any of the 8 premium FX included. SMACK – Bass Drums, Toms, Stomps Small, Stomps Large, Claps Single, Claps Small Group, Claps Large group, Snaps Single, Snaps Small Group, and Snaps Large Group. Claps & Snaps Natural – Claps Natural Single, Claps Natural Group, Snaps Natural Single, and Snaps Natural Group. Claps & Snaps Electronic – Claps Electronic and Snaps Electronic. Stomps – Kick, Kick Combos, Stomps, Toms, Wood, Plastic, and Metal. Combos – Combo 1, Combo 2, Combo 3, Combo 4, Combo 5, Combo 6, and Combo 7. Shakers & Tambourines – Shaker Collection, Glass Metal Gravel, Tambourine RR, Shaker RR, and Tambourine Collection. Found Percussion – Low Percussion, Industrial Percussion, Household Percussion, Kitchen Percussion, Loose Percussion, and Ticks. 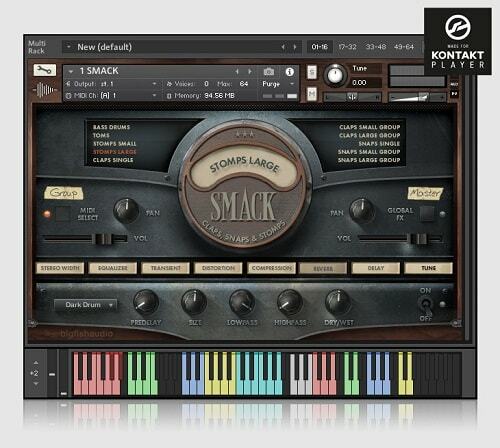 SMACK is powered by the industry-leading Kontakt engine. It is compatible with VST, RTAS (Pro Tools 9 & 10), and AAX (Pro Tools 10 & 11) plug-in formats allowing it to work seamlessly within any major sequencer, in addition to standalone use. Each patch contains up to 10 groups which can be individually edited and customized. Choose from any of the 8 included FX including Stereo Width, EQ, Transient Master, Distortion, Compression, Convolution Reverb (with hand picked IR’s), Delay, and Tune.